We manufacture a range of fully custom printed and branded pop up marquees & gazebos in different shapes and sizes with various colour options for canopies and sides available. The list of design options is endless and with our finishing touches and wide range of accessories we can provide everything you need to promote your company at any event. All Top Marquees are built to exacting standards, with our premier ranges boasting supreme quality that is backed by our 5-year warranty. 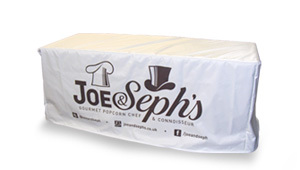 Our Instant Shelters can be individually designed and digitally printed to achieve the most eye-catching advertisement of YOUR product / services to YOUR target market. With over 20 years’ experience of providing top quality promotional materials, we can match you with exactly the right product for your needs. We don’t bombard you with hundreds of variations of our products - with our experience comes the knowledge of what works and what doesn’t - we anticipate any problems before they occur to ensure a completely hassle-free buying experience. 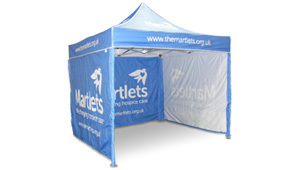 We are the exclusive manufufacturer of Top Marquees branded pop-up marquees and gazebos. 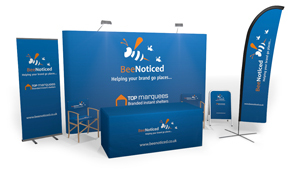 As the exclusive manufacturer of Top Marquees, BeeNoticed offer a dynamic range of easily transported shelters to suit all budgets. 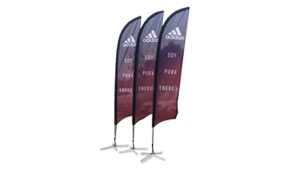 Our range of custom printed, branded promotional feather, quill, and teardrop flags really get your brand noticed at any event. Having a printed tablecloth with your logo or branding is an easy way to add style to your stand without breaking the budget. We have a huge range of exhibition stands and displays all of which offer a variety of advantages. We also have a new phone number, which is 01623 398260!